Here is a key-in I had to dig up for a project I was working on. All of my existing custom linestyles were placed in the design file at 60 scale. Now the sheet sizes were changing to a 50 scale. I used the key-in “change linestyle scale x” (x is the desired scale of the linestyle). Creating a selection set of all the elements prior to entering the key-in eliminates the need to select the elements individually. If you use custom linestyles that incorporate symbols or text, you may have been frustrated with the placement of the symbol or text. 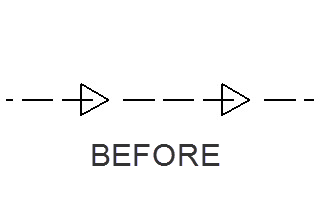 For example, using a custom linestyle for an electric line may look like — E —, the “E” may land on existing graphics or at other undesirable locations. 1. From the Main Task go to the Change Attributes tool bar. 2. Click the Modify Line Style Attributes icon. 3. In the Tool Settings dialog choose [Shift]. 4. Select the custom linestyle and then move your cursor to dynamically shift the linestyle to place the symbol or text at a better location. 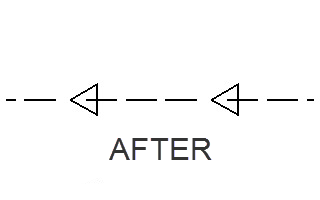 Some custom linestyles have directional symbols such as arrows or text. If you need to change the direction of the linestyle you can use one of the two options.